Our latest system design is a compact industrial scale system for treatment of vegetables and tubers by Elea Pulsed Electric Field technology. The SmoothCut™ One system is set up as a compact, all in one unit including pulse generator, treatment belt and vessel. 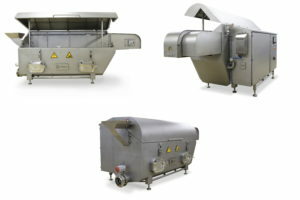 Due to its unique design the system is able to process up to 6 t/h of sinking and floating products. The state-of-the-art control system with touch screen panel allows to fully manage the process with maximum reliability and user safety. The safety system includes a monitoring and interlock circuit making a surrounding fence obsolete. Robust build and solid state typology makes Elea technology exceptionally reliable and provides low maintenance costs and 24/7 operation. Its small footprint and compact design makes it easy to fit into your current production line. With Elea PEF, we can create radical new opportunities for food products. 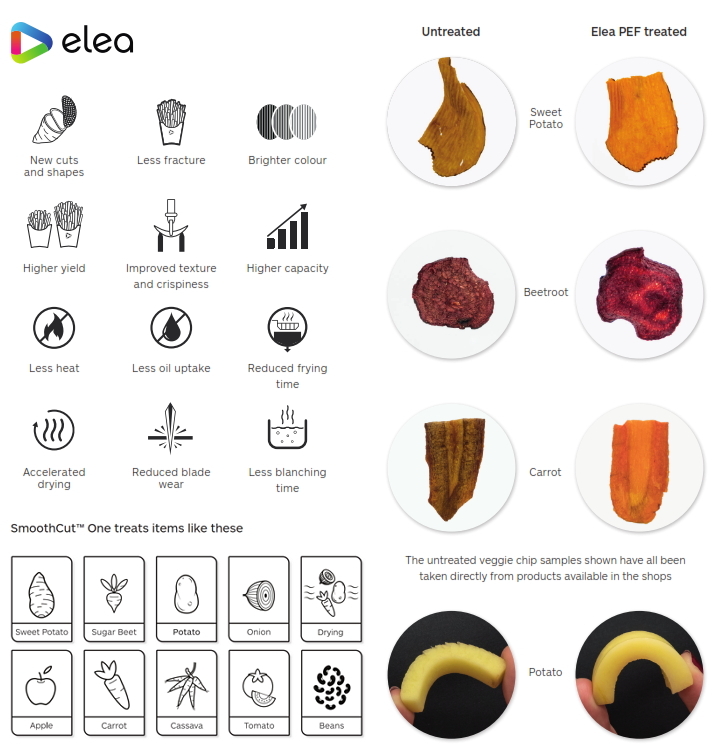 In the snack sector, the Elea PEF SmoothCut systems improve new shapes and cuts, less fracture, a brighter or more even colour, higher yield, higher capacities or accelerated drying and freeze drying. Elea PEF systems are transforming manufacturing processes – providing large energy and water savings, improving yield, and reducing labour costs. These efficiency improvements enable quick amortisation of investment costs on an Elea PEF system. The SmoothCut™ alters the cell structure and raw materials have their full potential released. For example, the untreated veggie chip samples shown here have all been taken directly from products available on the supermarket shelves. Against that, Elea PEF increases color vibrancy, radically improves development of dramatic shapes, enhances cutting ability, produces a smoother surface and improves texture and crispiness. More product pages with focus on beverages and other sectors coming soon!